Energy Transport Insider’s Special Reports give you in-depth coverage of a single topic or trend. In one read you get the context you need to get ahead of your competition and make informed business decisions. It’s like attending a seminar without leaving your desk. ETI's special reports are written by industry experts and our award-winning staff. We bring a deep base of experience and knowledge to each report. We highlight the news you need. More reports are in the works. Tell us about a topic you'd like to see covered. “When is ME2 going to open?! ?” That’s been the question of the day among tank car owners, lessees, lessors, brokers and rail shippers of liquified petroleum gas (LPG) for the past two years. Each fit and start tied to the opening of Energy Transfer Partners’ 275,000 b/d Mariner East 2 (ME2) natural gas liquids (NGL) pipeline has influenced short-term tank car sublease prices. When complete, the pipeline will carry purity NGLs such as propane and butane from the Marcellus/Utica shale region to the company’s export dock at Marcus Hook, Pennsylvania. Once the line is running as many as 5,000 tank cars per month could be idled. Energy Transport Insider has been tracking the short-term pressure tank car sublease market since September 2016. From 2016 to present, short-term tank car lease rates as well as shipped volumes have trended higher. Over the past two years, clear market trends have emerged giving insight as to optimal times to lease cars. ME2 has not been the only factor driving sublease rates over the past two years. Pressure tank car lease prices have also been buffeted by rail congestion, a rebound in crude oil values, weather events and the development and completion of export docks. 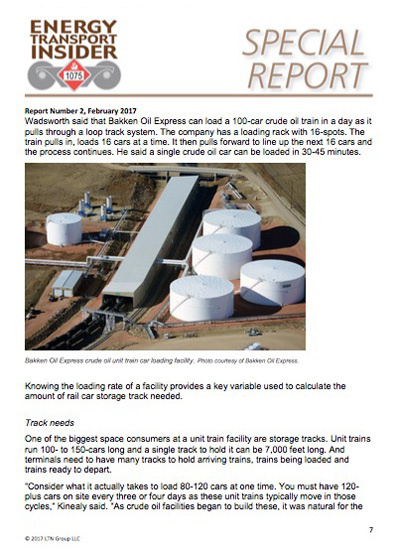 Perhaps the question should be “Aside from ME2, what else impacts rail tank car sublease rates and how has the market reacted?” Energy Transport Insider’s new special report gives you the answers as well as a look ahead. Rail Car Bills Rising? Here are 11 tips to help save you money! What Makes a Tank Car a Scrap Candidate? As new federal tank car regulations and Association of American Railroads (AAR) guidelines are put into play and car oversupply lingers, scrapping older tank cars that have not maxed their service life has growing appeal. Yet, when to pull the trigger depends on when it is most cost effective. Changing times call for creative solutions and rail car leasing companies burdened with thousands of unused rail cars desperately seek creativity. The solution may be more inelegant than slick – take them to the scrapper. There’s no straightforward formula to calculate rail car fleet needs. Every situation is unique, but, there are common issues to consider that can give a reasonable starting point for developing a rudimentary model. Quarterly reports are published in January, April, July, and October. Liquefied petroleum gas (LPG) and crude oil tank car lease rates rallied in the third quarter, with prices reaching levels not seen since the winter of 2013-2014 when the Polar Vortex became the talk of the season. This time around, tank car prices are at their highs well before the onset of winter. The factors driving general purpose tank car sublease rates differ from those driving pressure tank car sublease rates. Energy Transport Insider is the first news service to cover the market to ship liquefied petroleum gas (LPG) across North America via rail. Rail is a key link in the LPG logistics chain. And that's our singular focus - the LPG rail logistics system. Energy Transport Insider brings you the hard-to-get news and data you need every week to maximize your business opportunities.